Singer Banky W on Saturday announced that he’s running for office. The “Lagos Party” singer announced that he’s running under the platform of the Modern Democratic Party (MDP) for the Eti-Osa, Lagos seat in the House of Representatives in the 2019 general elections. 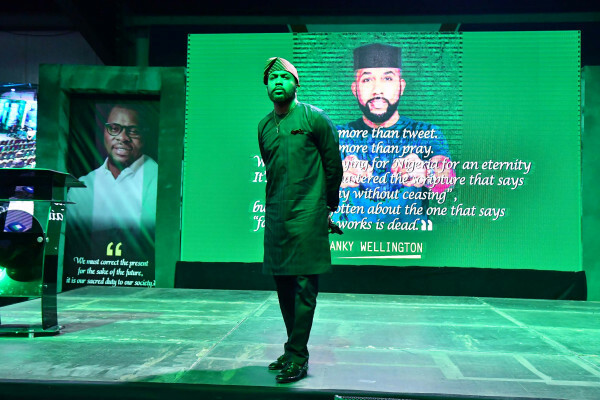 Banky W made the announcement at an event organised by the MDP tagged “Play Your Part,” where he gave a rousing speech about keeping hope in Nigeria. Nigerians are stuck in a lose-lose situation, he shared, and the solution is not to pick sides but to change the situation. Our generation does not really believe in the existing powers that be on both sides of the divide.. and for good reason. We have been taken advantage of and lied to.. we are tired and disenfranchised. We are frustrated and suspicious. We don’t believe in our current political options, so it’s time for us to build our own. We want a seat at the table of Governance in Nigeria, but we must bring our own chair. Because if we are to get in to leadership, it MUST be on our own terms and conditions, with our own vision and set of ideals… otherwise we risk being marginalized and handcuffed by the same systems we are criticizing. I have spent the majority of my life in Eti-Osa. It is where I went to Primary school and part of Secondary School. It is where I have built my home, and my business; it is where I plan to spend the rest of my life, with my wife and the children I pray God blesses us with. Most of the friends I have, most of the businesses I admire, and even most of the businesses that inspire our entire country are based here. The economy of Eti Osa is central to the Nigerian Economy, with a GDP contribution that dwarfs several states combined. And yet in spite of all this, it’s no longer a secret that much like Nigeria at large, the people in our neighborhoods are yearning for better representation, across local, state, and federal levels. Eti-Osa is infact, a microcosm of Nigeria as a whole. It is home to people from various backgrounds… it is home to the Market women in Ajah, the billionaires in Banana Island, the creatives living in Lekki, and the multicultural ethnicities in Obalende. We have people from various tribes and tongues, people from all walks of life.. extreme wealth, and extreme poverty. There are things that we should be proud of, and there are plenty areas for improvement. This is the headquarters of Corporate Nigeria, a model that has continued to encourage investors both local and foreign to sow into our country. And yet we still have residents who cannot afford 3 square meals a day. Everyone knows that we have generated trillions of Naira at our toll gates, yet we still have potholes. We have the very best and worst of education in our school system and the same could be said of the healthcare in our hospitals. However this is not the time to point fingers and accuse. It is the time for all our leaders and citizens to come together, across party lines, and work with each other to love, rescue and rebuild our society. If Nigeria is to work as a country.. then Eti Osa must first work as a community. We must team up, with each of us playing our part, to make this the most desirable local Government in the country, and that will inspire others to do the same. My legislative agenda and detailed manifesto will be shared on my website, and I encourage you to please take a look at it in the coming weeks and engage me on the issues of job creation, gender equality, youth inclusion and empowerment, affordable healthcare, and education. I would love to hear from my constituents, current leaders in Government, regardless of background or affiliation – we can do this, if we do it together. That is how we can fix Nigeria, one community at a time.